A Los Angeles auto accident lawyer from the LA Injury Group can do quite a bit for your case. Most people hear “accident lawyer” and imagine someone in a nice suit in a courtroom, giving an impassioned, well-argued case for their client. Yes, that happens sometimes, but it doesn’t happen all of the time. Most of our cases don’t go to trial. We can negotiate for our clients with the insurance companies (and others) but we do so much more than that, too. When you’ve been in an auto accident, hiring an attorney is one of the best things you can do for yourself. In this article, we’ll discuss ways we can help and ways you can help your own case, too. Collecting the evidence is a critical part of any auto accident case. Your lawyers have to be able to prove that the other person was liable for the accident. This is something we specialize in at the LA Injury Group. We’ve been helping clients for so many years to get all of the evidence they need for their case to take on the insurance company. When you realize that the insurance company is doing everything it can to make your case that much more difficult to win, you understand what you have to do to take on the insurance company. One of the first things we recommend that our clients do is to take pictures. Take as many pictures as possible. Take them of the auto that crashed, take them of the crash site, take them of the other auto or however many other automobiles crashed into you and make sure to take them of your injuries, too. Nothing ever stays the same and everything changes – that’s one way to explain why we recommend that you take so many pictures. Another is that you’re going to want all of the evidence you can. Someone else wrecked into you, you have the evidence on your side. So, you want as much of that evidence as possible. If you think “have I taken enough pictures” the response should be “maybe I should take a few more.” Your vehicle is never going to look exactly like it does in the moments after the accident. Collecting pictures of it at the time is vital to helping your case. The more pictures you can get of it, the better. One of the major reasons for this is that, often in the wake of an accident, you may not know exactly what can help prove your case. It might prove to be that the pictures you didn’t think you had to take of your trunk that wasn’t harmed, or your door that was only slightly dinged, was just the piece of evidence that proved conclusively how at fault the other party was. It’s important to clarify what we mean when we say “take pictures of the accident.” What exactly then constitutes “the accident?” Take pictures of the road. Take pictures of anything that the vehicles may have collided with. Take pictures of the environment. This is yet another case where the picture you don’t think is important ends up being the one that proves the truth. For example, maybe you take a picture of the road that’s a bit removed from where the accident was. You don’t think much of it, you just happened to read a blog online that said to take as many pictures as possible a few times. Then, when you give your attorney at the LA Injury Group your pictures, we get to work. We go over all of the pictures you took and begin doing our research. Then, after a bit of work, we come across something: the area of road that you had in one of your pictures was actually worked on last year… but they didn’t do a good job putting it back together. Now, we have someone else that may be liable for your accident. We have the driver that collided with you, the company that worked on the road and maybe even the municipality that hired them. Suddenly, you could be looking at that much more potential compensation for your accident claim, all because you took one picture. Obviously, the above story is a bit of an exaggeration. But, even with that said, that’s the kind of thing that can happen when you collect the evidence that’s on your side. By that same token, be sure to take pictures of yourself, too. Even though it may not be easy to do so, taking pictures of your injuries can help make your case so much stronger. If it’s difficult for you to take pictures of your injuries (and it’s certainly understandable if that’s the case) then you can ask a friend or loved one to do it for you. Getting pictures of these injuries at the beginning is critical. You’ll also want to take pictures of these injuries as they heal, too. Remember: the insurance company is looking for any way they can to discount your injuries. They do not want to have to pay you for what you’ve been through. Everything the insurance company does is predicated upon the idea of paying people less than they’re owed. Indeed, it’s the way that the insurance company makes money. By making sure that you get less than what you should, the insurance company gets their cut. So, you don’t want to aid them in this quest if you can help it. Taking picture of yourself as you heal shows everything that you’ve been going through. It provides an important, step by step demonstration of how bad the injury was, and how you deserve damages for it. 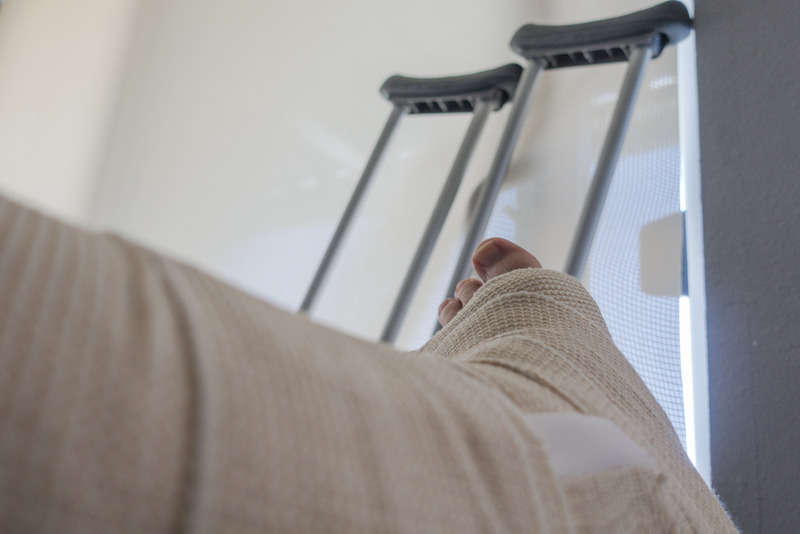 Typically, these pictures of your injuries go hand in hand with documenting the difficulties you’ve encountered in life since you’ve had the injury. For many people, recovering from an auto accident is not easy. It requires lots of hard work and recovery. By documenting that, you can show the other side, (as well as a judge and others should it come to that) just how hard this process has been on you. It’s important for others to know your story. Of course, you’re not on your own when you collect evidence, far from it. We ask that you do that just to make it easier. We have many ways of collecting evidence, too. Here at the LA Injury Group, we have a great team of investigators on your side. They can go over your crash site, too. Many of our investigative pros were investigators before they worked for us – for the cops, the military and others. Now, they can put those skills to work in getting you the evidence that your case demands. They know what to look for to prove the other side’s liability. It’s important to remember that the insurance company has investigators on their side. You know those investigators are going to do everything they can to prove that you were liable for the accident. Whether that’s true or if it isn’t, they’re fully committed to showing that you were at fault. To counteract that and get the truth out, you deserve to have professional investigators on your side seeking out the real truth. That’s just one of the many ways we can help you get the evidence. Another way we can help is to get your medical records. Sure, you can ask your doctors and medical providers yourself, but we’ve been doing this for a long time. We can get the evidence in a hurry and present it in the most compelling way. To sit down with us for a free consultation to see every way that we can help your case, give us a call at (818) 210-4558 or head to our site.